The long-awaited debut album by uprising Dutch folk metal band Alvenrad will be released via the German label Trollmusic on April 4th in Europe and April 15th in the US. 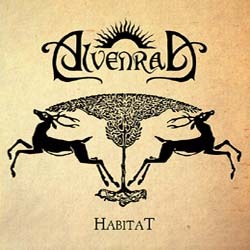 It is entitled “Habitat” and it contains nine powerful tunes, which combine the archaic charm of wooden folk & black metal with the enthusiasm of classic bands like Uriah Heep, Iron Maiden or Judas Priest. The album has been mastered by Markus Stock (Empyrium / Studio E) and will be published as noble digipak including a booklet with all lyrics, translations & liner notes by the musicians. Alvenrad have unveiled the cover artwork, the album tracklist, as well as their first official video for the song “Woudakoestiek” that you can watch below and get a first taste of their music. Hailing from the mythic heart of the Veluwe, the Dutch duo Alvenrad offers a fresh blend of folk-influenced heavy metal. The nine lively tunes on its debut album “Habitat” root deeply in various traditions and like branches of a mighty tree they spread towards the sun, encouraging the listeners to follow them on an adventurous voyage on pathways untrodden by most contemporary bands. Alvenrad is a free Dutch translation of a kenning for the sun used in the Edda, approximately wheel of the elves. With the passionate help of brilliant guest musicians, Jasper Strik and Mark Kwint created a debut album reflecting the strong burning love for their “Habitat” – a home which is described through landscapes, literature, paintings, classical music and the wild mixture of them all. “Habitat” is for all music lovers who enjoy enthusiastic & powerful folk metal, especially fans of Vintersorg, Myrkgrav, Skyclad, Jethro Tull, Empyrium, Windir, Forefather and Borknagar should give this band a listen!